To view Satan as an actual being is rejected as a mere medieval superstition that could be slain like a dragon by the sword of a conquering knight. In the simplest way “what is the devil?” The answer to the big question is creative intelligence. It is a portion of energy and intelligence which came out of spirit to make and construct this physical world of substance or matter and manifests as two forces the world of duality. There it unfolds as darkness and light, love and hate, joy and sorrow, heat and cold, life and death. The purpose of this dark force Satan or devil is to perpetuate the force of duality which we call avidya or maya, ignorance or delusion and the purpose of yoga meditation is to reverse that. Maya is no difference then the great illusion like television. Can Man Beat Satan at His Own Game? Do we know what is the role of Satan in creation and in life? Except in a non-subjective way the average person does not see the violent resistance of Satan against the goodness and the captivating attraction of God. Great saints who were near liberation have been known to see the devil manifest in form to tempt them, however no such theatrics are required by the devil to catch the ordinary man, for this conscious force knows a little or subtle temptations normally suffice. 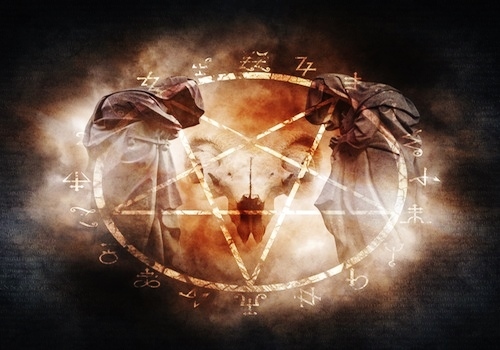 Satan is the great master of persuasion and when a person tries to do good by avoiding the temptation of this world he suddenly finds it “coincidental” that out of nowhere opportunities and people seem to appear conspiring to remove him from his chosen path of determined self-control. In his present stage of evolution, a life without difficulties would be of little value for the ordinary man when there are lessons for growth to be learned and the need of an incentive to know one’s maker. An ideal existence in a different realm and time is not an illusion, it is possible, but it is reserved for those who have graduated after they have learned from the lessons assigned to them during each lifetime on earth. The good and evil in this world are nothing but shadows of light that shape the contrasts essential to create God’s universal cosmic movie. On the dark backdrop of evil you see the white purity of righteousness demonstrating its virtue. All children of God must go through testing by cosmic delusion in order to acquire good judgment which enables man to differentiate good from evil and equally possess the will power to surmount all trials and tests to finally become liberated from Satan’s cat and mouse game of temptation. You will find that when you want to do evil in this world it will assist you just as it takes no effort for a ball to roll down a hill, but when you want to start on the spiritual path you will find yourself swimming up against the current of the world. God could simply countermand the influence of Satan’s temptation, but this would offset man’s free choice and make him a pawn. In the scheme of the Lord’s drama of creation, His cosmic show is to perchance find out if His children will opt to choose Him (applying good judgment) over Satan’s (cosmic delusion) deceptive power of appearances. Man succumbs to evil due to the influence of prenatal-postnatal tendencies and past bad habits which are consciously pushed by satanic evil entities residing in the brain. Obsessive evil entities may be dislodged from the brain by the practice of self-control, right actions and higher meditations given by one’s guru. Every worthy cause requires hard work against hostile forces but we must fight these forces with an iron fist. By applying good judgment every time, you will finally succeed. In one sense, misery is man’s benefactor, because it compels him to search for sadness-transcendence in God. Except in a relative sense it is difficult to find a boundary line between good and evil. By saying that the origin of evil is subjective, some try to explain Satan away as arising from psychological causes from the actions and thoughts of man himself. Perhaps this could be said in a heinous case committed by souls that were so villainous causing affliction to their fellow beings; but that does not account for premature death, injury and the pain of disease. Some view evil as subjective and all these miseries as results from the wrong choices and actions of man because of lack of unity with universal rules. It is certainly true in this sense that evil is self-engendered in man’s life. There is a divine gift of free choice that man possesses to align himself with God’s immortality, peace and goodness. It seems that only after getting burned by the alluring flames of painful excess do many learn self-control. It is much wiser to avoid harmful lessons by observation of the painful consequences inflicted on others by exercising good judgment and spiritual guidance. Many facts support the argument that evil is subjective and that people may be responsible of misuse of reason subsequently causing in harmony and creating evil. However the explanation is flawed and it cannot adequately account for all the aspects of evil in creation. Due to the influence of Satan, man is stricken with a fallacious conception of death as obliteration, rather than envision its underlying unchangeability. Satan, casting his net of delusion like a fisherman around all of humanity is constantly dragging man downward toward the slavery of finitude, death, and delusion. Satan continuously attempts to bait mankind with promises of pleasure and greed and guides people to repeat self destructive reincarnations and destruction. Once a desire is fulfilled Satan’s dazzling temptations forces man to fall into his worldly nets ever suggesting new desires into the consciousness of man to induce him into to reincarnation again and again. Satan could be annihilated in an instant by the Almighty but because God gave all men and Satan as well independence souls can only be freed with their cooperation and permission. There is such a delusive attachment to the physical body which has been created by Satan that even at this moment if freedom and liberation were offered by God to all the masses, there would be few eager to depart this merry playground to run away from their familiar bodily home with all their possessions and sensory delights. The sense-oriented body-attached are inflexibly hesitant to surrender known pleasure for the mysterious joy of spirit. Earth is the schoolhouse where so much learning must be experienced before man is prepared to use his free will to discriminate toward the emancipating patterns of God and all delusive soul-binding patterns of Satan. Man cannot be held responsible for being tempted, but he is responsible for choosing to act on evil temptations. From the very beginning the satanic force is, was and will be the devil, as we know, the liar and murderer. Bacteria by the millions and armies of invisible virulent microbes silently move around our terrain lurking, like ravenous insects, to wipe out the harvest of human beings. Animals and plants that have no karma or free choice of their own are infested by numberless diseases. Death by cataclysms, famine and floods where millions of people are destroyed it seems impossible bad karma could have caused such sufferings and for so many to be wiped out at once. How do you account for cannibalism in nature? The big fish eats the little fish: baby salmon survives by living off the flesh of its mother. If God is good and man is made in the image of God then logically man should be not anything but good. Then why are men murdering each other in war and from territorial and industrial selfishness and why this cannot be avoided by parliamentary negotiations? Why do the thoughts of greed, revenge, jealousy, wrong judgments and selfishness arise in human minds? It is because evil existed from the very beginning to delude and influence man’s free choice. The power to affect incorrect decisions in men, all the death-wielding germs, natural cataclysms, physical temptation, animals preying on each other and the devastating forces in nature were not created by man. History tells of the burning of witches and martyrs at the stake in the name of the Christian faith, the Crusaders who fought in the name of Jesus who preached love for one’s enemy and the Aztecs who in front of their idol Gods cut out the hearts of their war prisoners, over a hundred at once. The emperor of India Tamerlane slew almost a million Hindus after his conquest and despots like Hitler who gained control of power to rain havoc and horrors on civilization. The unresolved conundrum still persists. Did God in his perfect plan have Satan in its origin? God himself answered Isaiah: “I am the Lord and there is none else; I create evil and make peace, I form the light and create darkness, I the Lord do all these things.” Some men rebelliously protest why the all-powerful Lord who knows of the sufferings of man would let vulnerable mortals suffer from the scourge and temptations of Satan? Assume not that God is enjoying himself in his heavenly existence in selfish joy. God is definitely suffering the tragedies of man’s delayed evolution to his heavenly paradise. God’s compassionate love has been expressed munificently. He has sent us Divine saviors through His incarnate sons whom audibly speak his silent voice of the kingdom of heaven. While one is still struggling with delusion it is pure folly to rebuff objective or subjective evil. We urgently need to protect ourselves and be watchful of the destructive patterns of temptations and evil everywhere. Man should never consider it possible to beat Satan at his own game. Just when someone feels bulletproof and invulnerable Satan cleverly tricks his challenger with some subterfuge and the opponent loses. It is best not to enter into his game of temptation. There are numerous entertaining games in God’s playing field to test one’s mettle to prove if one may come out as a commendable winner. It is wise not to reject Satan as nothing more than a delusion. Always remember environment is stronger than willpower. Be careful with whom you associate with at all times. From the teaching of Paramahansa Yogananda.